Travel package to Pittsburgh, Pennsylvania USA for a clash between the AFC titans. Pittsburgh Steelers vs the New England Patriots on Sunday December 16. *This is a DEPOSIT ONLY - The Event organizer will be in touch once your deposit is solidified to complete your full package booking! 2 nights stay at the beautiful Sheraton Pittsburgh Hotel at Station Square located at 300 W. Station Square Drive, Pittsburgh, PA 15219. Sheraton Pittsburgh Hotel at Station Square offers travelers to the Steel City spacious accommodations, thoughtful amenities and a superb riverfront location with panoramic city views. Benefit from the hotel's prime location on Pittsburgh's energetic waterfront, in the heart of a 52-acre complex that includes Station Square's array of restaurants and entertainment. 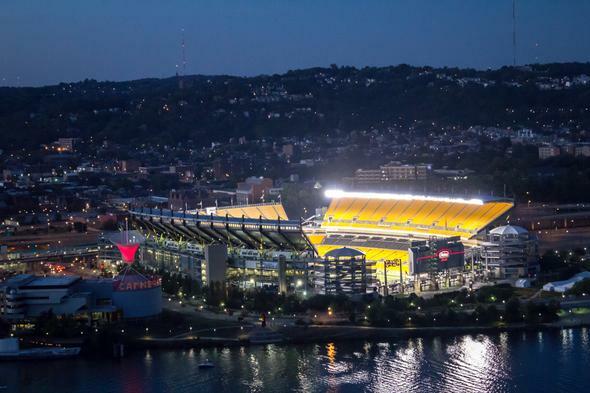 Experience exceptional service and enjoy convenient access to top restaurants and attractions such as Heinz Field, PNC Park, and the Rivers Casino during your stay. Reenergize in the Sheraton fitness centre or go for a swim in the indoor heated swimming pool and hot tub. Visit www.sheratonpittsburghstationsquare.com for everthing the hotel has to offer. Call today to book what might be the final clash between Big Ben and Tom Brady, and this great opportunity to visit Pittsburgh and see all it has to offer on one of the biggest game day weekends of the season.